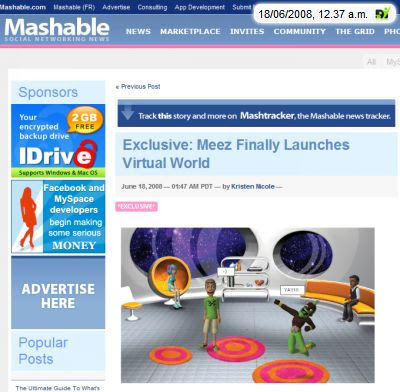 Mashable has just reported that meez is now launching an own virtual world for its avatars. The meez avatars are fantastic; there is no doubt about that. But the users of the cute little figures now obviously want more action, that is to say more interaction and socialising with other meezes. Mashable writes “Unlike most other virtual worlds that have grown out of an avatar creation and sharing site ...”. Exactly, others too began with avatars and are now building virtual worlds around “their” avatars. Everyone for himself and everyone differently. Sure! No-one wants to share his users with others! The result is that walled gardens are to be found everywhere. But what has that got to do with mountains and prophets? We believe that building own worlds for each avatar solution is not only cost and time consuming but also leads to a lot of dead ends. It is almost as if the mountain has to come to the prophet Mahomet. I am not sure when a mountain last moved but it must have been before the age of the Internet. Mahomet should come to the mountain. That’s our attitude with weblin. The largest virtual world is already there and does not first have to be created. It’s the Web. Sure, it is all still only 2D and not quite as spatial as one would imagine a virtual world to be, but, instead, people are already there! And they are already finding all sorts of distraction in this world – reading, watching videos and, with weblin, they can chat with friends or strangers who could become friends. They can collect points and give presents, wave, dance and laugh. OK, one can’t exactly roll on the floor laughing but, hey, it’s a good idea! Meez is out to turn the virtual world into money, with advertising “... which can be branded as part of Meez’s advertising options within this virtual world. Just as brands like Nike, Panasonic and Sears have provided gear ...“ This, to my mind, is a form of In Game Advertising. And I bet that, in addition to advertising, virtual goods are also part of the concept. All things considered, I am glad about every avatar creator, every virtual world, whether mountain or Mahomet, because this can only advance our mutual idea of the Next Generation Web.